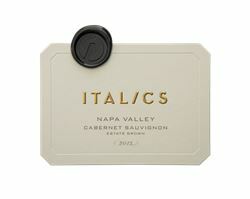 Italics is a luxury producer of Bordeaux varietals and blends from Napa Valley. Helmed by Proprietors Ken and Mike Martin, and Managing Partner Taylor Martin, we employ both estate and negociant winemaking to the same end: to highlight the best of what Napa Valley has to offer. The brand began over a decade ago with the launch of Thirteen, a blend of wines created from vineyards in each of Napa’s 13 sub-appellations. Over the years as Napa continued to sub-divide, Thirteen became Fourteen, Fourteen became Fifteen and soon, Fifteen will become Sixteen with the release of our 2012 vintage. While searching for a vineyard to represent Napa’s 16th AVA (Coombsville) we found our new estate home. Here, on 73 acres in the foothills of the Vacas southeast of Napa, we are constructing a winery, complete with 16,000 sq. ft. of caves and stunning views from almost every perch. We aim to create what can only be described as wine bliss. Italics is a luxury producer of Bordeaux varietals and blends from Napa Valley. Helmed by Proprietors Ken, Mike & Taylor Martin and Winemaker/Partner Steve Reynolds, we employ both estate and negociant winemaking to the same end: to highlight the best of what Napa Valley has to offer. To join the wine club, visit https://www.ItalicsWinegrowers.com or call 707-258-0106.